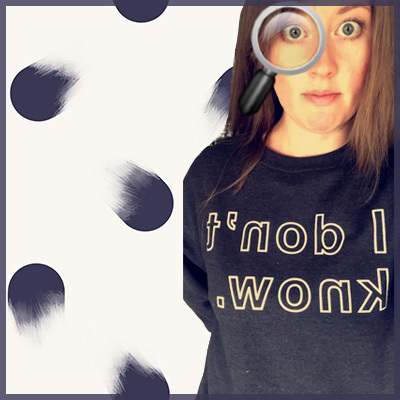 It’s hard to believe a month has gone by since my first snack and beauty box reviews. 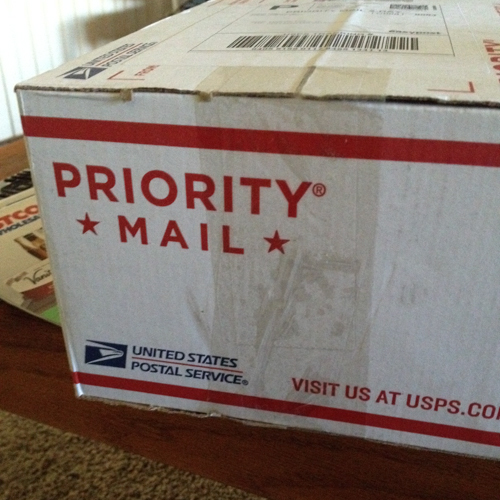 I look forward to the arrival of these boxes so much that I feel I wish the month away – it’s just so exciting! 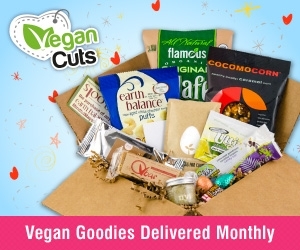 For October, Vegan Cuts packed the snack and beauty boxes together to save space and include a larger item (not sure which one that was) but I think it worked out great. I’ll resume next week with a new Feed Your Skull a snack Wednesday. Without further ado. October held all sorts of snack heaven, including 4 exceptionally good vegan halloween-type treats. 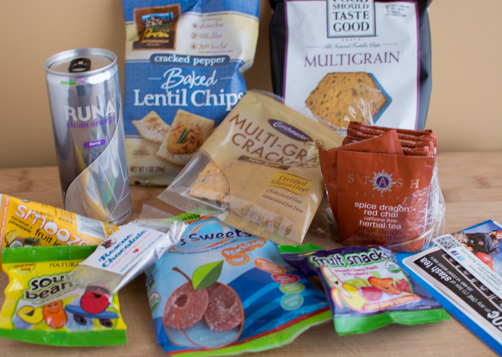 The #1 reason I’ve liked the snack box subscription is because I get to try things I most likely wouldn’t buy at the store. 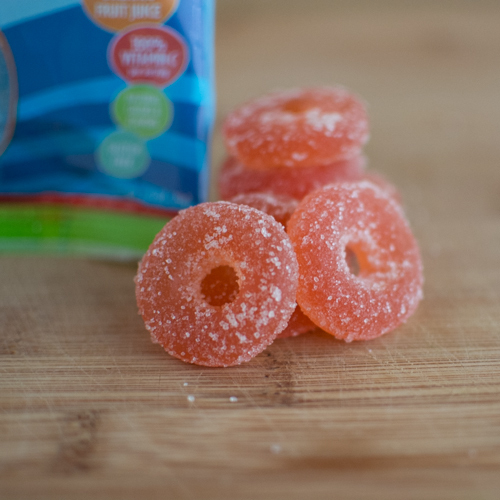 I loved these YumEartH fruit snacks, they are a perfect example of something I wouldn’t normally buy. In high school I loved getting my hands on sour patch kids, we would go to Target before a movie and save money by getting our snacks there instead of the theater and sour patch kids were always in the mix. 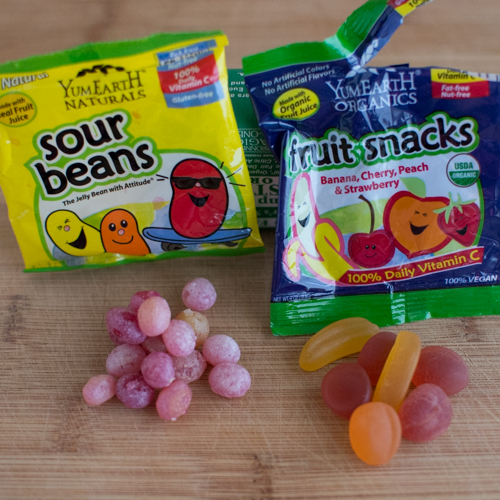 These sour beans and fruit snacks are like the cute organic version of sour patch kids and swedish fish. My eyes were rolling back in my head—pure pleasure. You won’t find any high-fructose corn syrup in these guys. Sour Beans Ingredients: Natural Sugar, Glucose Syrup (from tapioca, rice, or corn), starch (from tapioca, rice, or corn), modified food starch (from tapioca, rice, or corn), fumaric acid (for sour), tartaric acid (for sour), ascorbic acid (for Vitamin C), natural flavors, acacia gum, purple carrot juice, beta carotene. Fruit Snack Ingredients: Organic brown rice syrup, organic sugar, pectin, citric acid, natural flavors, organic juice concentrates (carrot, apple, pumpkin, radish, black currant), juice concentrate (carrot, hibiscus), ascorbic acid. Rescue Chocolate Mini Peanut Butter Pit Bull. Jeremy wanted these all to himself but I didn’t let that happen. Chocolate must be shared! 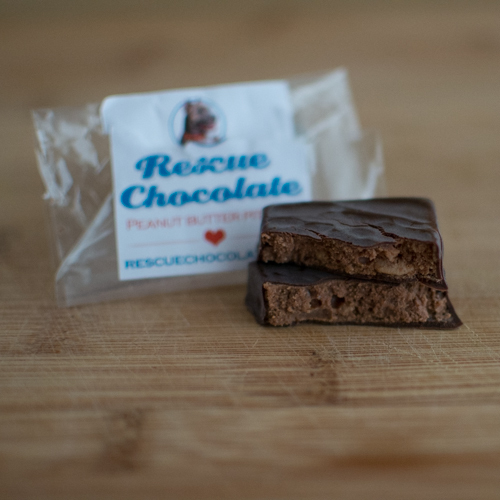 These awesome little squares were packed with chocolate peanut buttery intensity PLUS “Rescue Chocolate is “the sweetest way to save a life!” From each chocolate purchased, 100% of the net profits are donated to animal rescue organizations around the country”. How amazing is that? 100% of net profits (the amount left over after all deductions are made) go towards helping animals! Mini Peanut Butter Pit Bull Ingredients: 66% Organic dark chocolate (cacao beans, evaporated cane juice, cocoa butter, soy lecithin), peanut butter, sugar, cocoa butter, toasted rice (rice, sugar, salt, malt flavor), peanut oil, kosher salt. 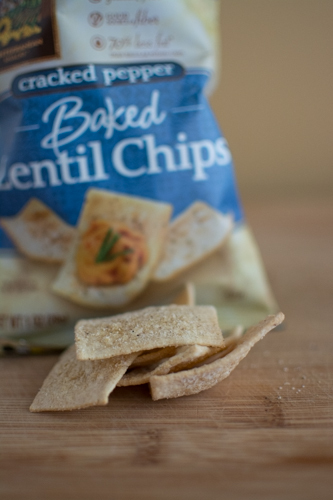 Mediterranean Snacks Cracked Pepper Baked Lentil Chips. Now where we don’t buy sugary snacks (well Jeremy does on occasion), we do buy chips. We love buying these kinds of chips. This was my first time trying this brand and out of all the chips included (they were all good) these were my favorite. A few too many ingredients but I loved the texture and flavor. They are gluten-free and non-gmo project verified. Ingredients: Bean Flour (lentil & garbanzo beans), potato and/or pea starch, potato fiber, high oleic sunflower oil, seasoning (sea salt, cane sugar, black pepper, tapioca maltodextrin, onion powder, garlic powder, autolyzed yeast extract, malic acid, white pepper, expeller pressed canola oil), potassium chloride. 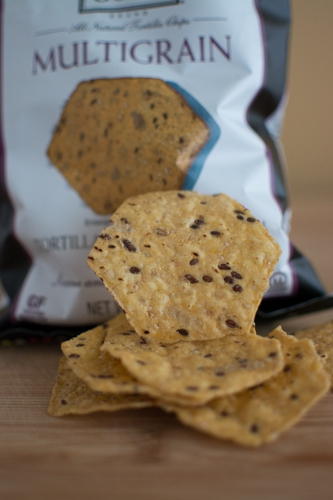 Food Should Taste Good Multigrain Tortilla Chips. Delicious with a fun shape. After looking on their site, I see all their chips are fun shapes. The illustrations on the front of the package remind me of Cooks Illustrated. The ingredient list is quite long compared to the average tortilla chip but these are multigrain and have twice if not three times the fiber and protein of a 3 ingredient tortilla chip. Ingredients: Stone Ground Corn, High Oleic Sunflower Oil and/or Safflower Oil and/or Canola Oil, Brown Rice Flour, Flax Seeds, Evaporated Cane Juice, Oat Fiber, Sesame Seeds, Sunflower Seeds, Quinoa, Soy Flour, Sea Salt. 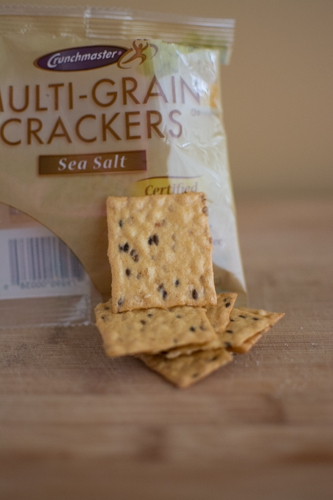 Crunchmaster Multi-Grain Sea Salt Crackers. Rice crackers are such a treat! I’ve had the ones from Trader Joe’s and Costco. Crunchmaster was definitely better than the ones from Costco and probably just as delicious as the TJ’s ones I’ve had. Did I mention we split everything. Sigh. Ingredients: Brown rice flour, whole grain yellow corn, potato starch, safflower oil, oat fiber, dried cane syrup, sesame seeds, flax seeds, millet, sea salt, and quinoa seeds. Stash Spice Dragon Red Chai. I’ve been a fan of Stash tea for a long time and I saw a lot more of them when we lived in Portland because they are based out of Tigard, a Portland suburb. When I saw all of this tea included, I was thrilled! 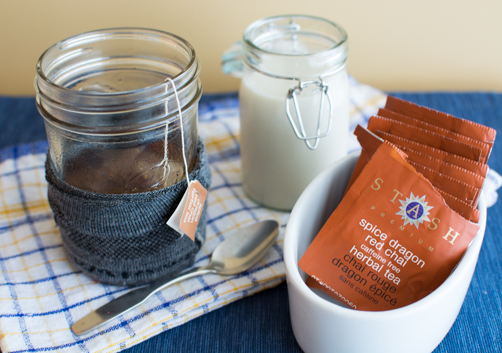 Spiced teas (aka chai tea – which actually means ‘tea tea’) are some of my favorite types of tea. I currently have their other variety called Chai Spice which is good but the Spice Dragon has just taken over as my new favorite. My tongue said so. I wonder what the biggest difference is? I like to brew the tea in a larger mug with 6-8 ounces of boiling water, add a little sweetener (stevia, maple or agave) and then top it off with cold or warmed almond milk. Perfection. Ingredients: cinnamon, rooibos, ginger root, clove. 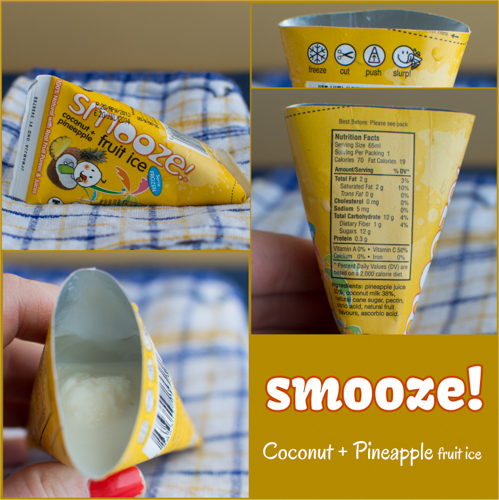 Smooze! Coconut + Pineapple Fruit Ice. Amazing! The first thing I tasted was the pineapple juice and it took me off to a tropical island away from my current location and its 20 degree weather. It was frozen solid but I let it sit out just a wee bit too long before snapping photos. It had a great texture and was definitely inspiring future popsicle and smoothie flavors in my mind. I see from their site that they also have a pineapple mango flavor and I’m very interested in that as I believe mangos could bring about lasting world peace. 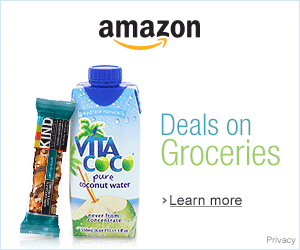 They are available through Amazon in bulk, just pop them in the freezer when they arrive. Ingredients: pineapple juice 50%, coconut milk 38%, natural cane sugar, pectin, citric acid, natural fruit flavors, ascorbic acid. Runa Clean Energy Drink (Berry). I need to preface this review with a bias. I’m not a fan – at all – of energy drinks – of any kind. That’s completely my opinion and that’s okay. Even though I’d like if you didn’t like energy drinks either, I know that can’t always be the case (late shifts, studying + work, etc). If you were to buy an energy drink, I’d suggest you find a more natural product like Runa over one like Redbull. 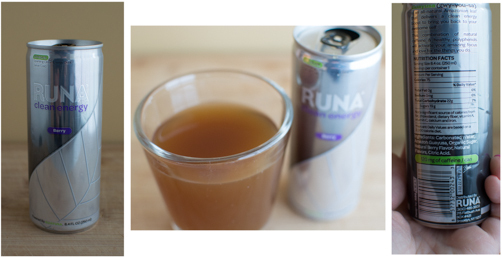 From Runa’s site: Clean Energy is an entirely new take on energy drinks. One can of Runa Clean Energy has 50% more caffeine than a Red Bull, 650 mg of polyphenol antioxidants, and a clean, smooth taste – all from one brewed leaf, not a lab. Did it taste good? Yes, it had a great taste. Did it give me energy? 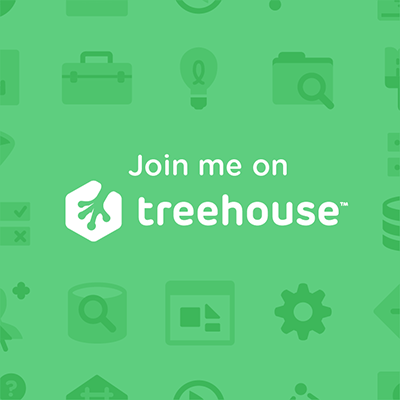 Yes, I feel like a cracked out monkey and have trouble keeping my fingers on the keyboard. Needs to go for a walk to expel some of it. What does it taste like? It took me a little bit to figure out what the flavor reminded me of. Then it hit me! It reminds me of a subtly berry-flavored instant (read: powdered) tea, the kind I used to mix with tang and sugar to make Russian tea. Ingredients: carbonated water, organic amazon guayusa, organic sugar, natural berry flavors, natural flavors and citric acid. Karitex 100% Organic Shea Butter. 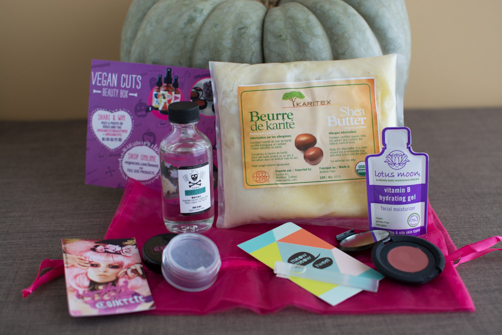 My number one favorite favorite thing from the beauty box this month was the massive packet of shea butter. Organic unrefined shea butter. I’ve been wanting to buy some for a while but kept putting it off. I can’t wait to really start playing around with it. I could make lip balms, use it on my face with the cold weather approaching, to nourish my hair, on cracked heels and so much more. 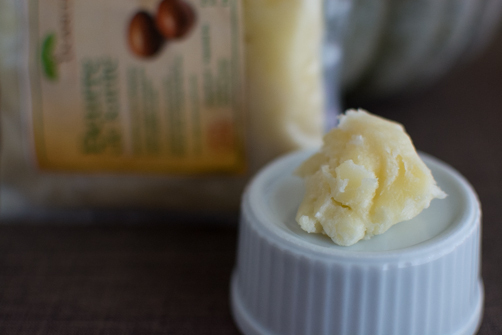 What do you use shea butter for? 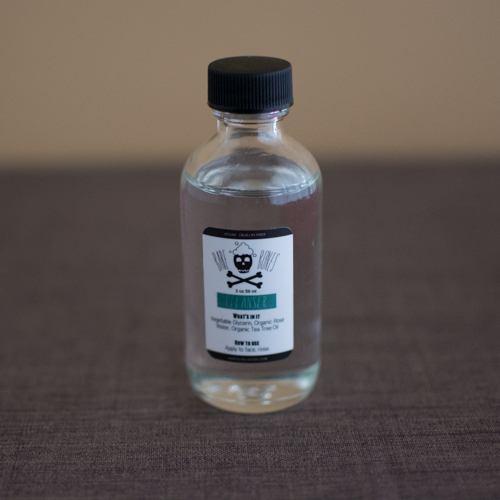 Bare Bones Cleanser. Love the name, the skull, the ingredients, the smell, and the product. If you love rose-water things you will probably love this as much as I did. It has a texture that’s just slightly thicker than water and goes on really nice. It felt very soothing on my skin and didn’t cause any strange reaction, it also seemed to calm down the redness of my cheeks. Ingredients: vegetable glycerin, organic rose-water, and organic tea tree oil. The All Natural Face: Vegan Matte Cream Blushes for Lips and Cheeks. Love it. I used it on both my lips and cheeks and it looks great with my pale/red skin. If using on the lips you can benefit from a coat of gloss to really make it pop. 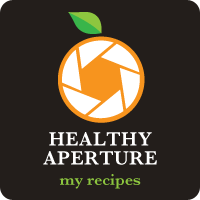 I just perused their site for a little bit and they have so many offerings. As a Bare Minerals user, all of their mineral foundations/blush/eye shadows intrigued me. Also, the prices looked too good to be true which I love when it comes to makeup. Definitely check them out. 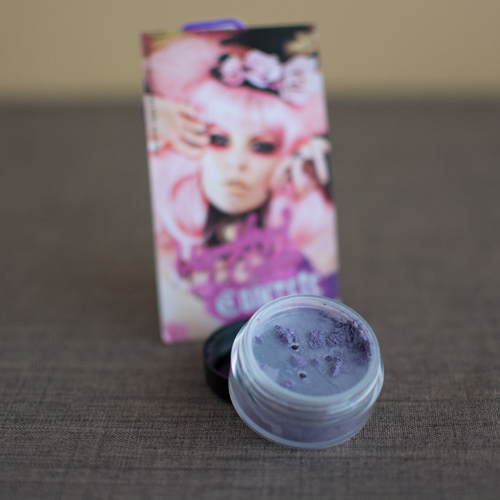 Concrete Minerals Wicked Mineral Eyeshadow. Loved it. I have hazel-green eyes and light purple or mauve tones look great with that color. 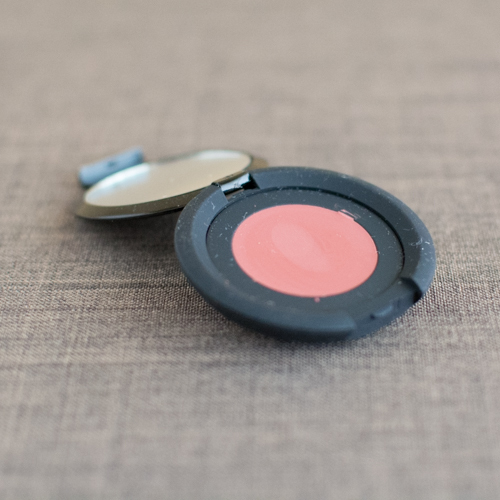 It’s a highly pigmented eyeshadow – which means a little goes a long way. You can wear this light for everyday or heavy for some of the dramatic looks shown on their site. Ingredients: Mica, Titanium Dioxide, Iron Oxide, Tin Oxide, Ultramarines, Boron Nitride. 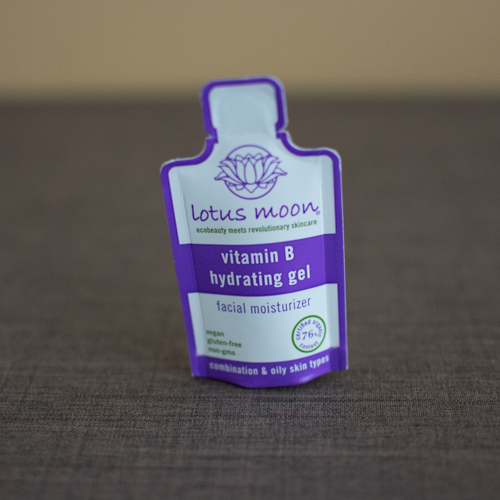 Lotus Moon: Vitamin B Hydrating Gel. Loved it. Gel is an appropriate description, it has a light milky color and goes on light and absorbs well. I’ve only used it once so far but it didn’t dry out my skin or do anything weird for how light it is. I love the idea of their products but after seeing the price, I was like damn. I’m just not one to spend $30 on some lotion. Am I crazy? Do you wear stuff that you swear but is a little bit more expensive? edit, 3/16/16: This has become one of my MOST FAVORITE everyday/every night beauty serums. I use bottles completely up and repurchase. Can’t get enough. One bottle lasts me 3-4 months. Ingredients:Aloe barbadensis (Aloe Vera) Juice*, Glycerin (Vegetable), Niacinamide (Vitamin B3), Aspalathus linearis (Rooibos Tea) Extract*, Vaccinium macrocarpon (Cranberry) Extract*, Emulsifying Wax, Persea Americana (Avocado) Oil, Azadirachta indica (Neem) Oil, Rosmarinus Officinalis (Rosemary) Oleoresin, Essential oils of Bergamot, Cinnamon, Grapefruit, Lemon, Lime, Mandarin, Orange, Patchouli, Peppermint, Rosewood, Tangerine and Ylang Ylang; Sodium Benzoate, Glucolactone, Xanthan Gum (Polysaccharide Gum), Beta Carotene (Pro Vitamin A), Sodium Hyaluronate (Hyaluronic Acid). *NOP Certified Organic. 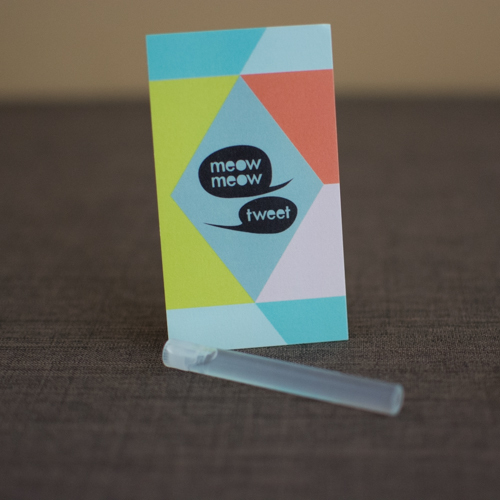 Meow Meow Tweet Geranium Basil Body Tonic. I love everything about their ‘look’ and what they offer. This particular scent isn’t my favorite but I think that’s because the witch hazel is very strong at first. The scent seems to adjust for the better the longer it’s been on my skin…interesting. The ingredients are beautiful though! Ingredients: witch hazel distillate, organic rose and lavender waters, organic vegetable glycerin, essential oils. If you haven’t caught yesterday’s post on truly simple meal planning, the plant-based way, be sure to check that out. I’m also hosting a giveaway within that post for a natural stone pendant. 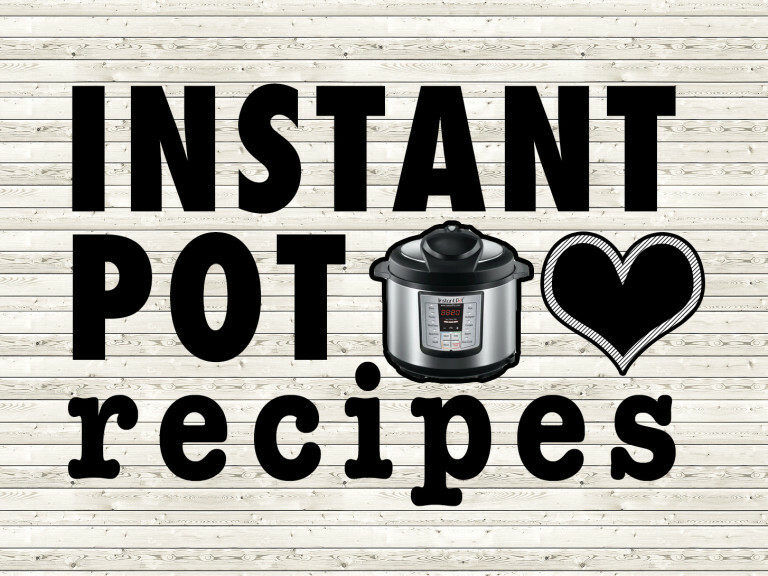 The Ultimate Simple Meal Plan: Zhang Dinners Plus a Pendants by Alma Giveaway!